Nice little cartoon this, by Fei Wang aka Mr Slowboy. It’s part of a series he’s doing on the 10 best dressed men at Pitti. Look him up @mr.slowboy for others including George Wang, Haruo Suzuki and Simone Righi. We each add our 10 cents on style too. 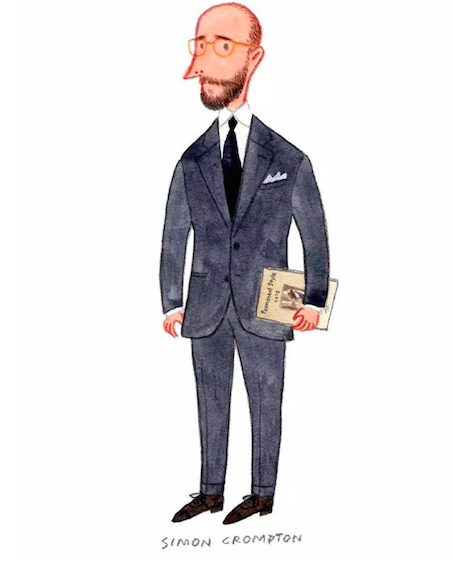 I make this the third time I’ve received cartoons of myself over the yeras – the others being from Jonathan Cusick and Yoann Duran. They’ve all had their own distinctive styles, which is nice. You can follow the discussion on Cartoon by Mr Slowboy by entering your email address in the box below. You will then receive an email every time a new comment is added. These will also contain a link to a page where you can stop the alerts, and remove all of your related data from the site. Haha such a cool cartoon! I want one made! Simon , any chance we could have an article from yourself of the type done on the 8th Feb by Hugo of Parisian Gentleman , ” How I built my wardrobe”? Not sure I would be quite so happy if my sloping shoulders were quite so prominently exhibited! It depends what you will wear the suit with, but probably dark brown - it will be more versatile.